Mrs. Kinab is a 46 year old mother of five children in Lake Sebu, South Cotabato. She is the mother of Kinslee Sinangayan, a kindergarten student in the Tboli tribe village of Lake Seloton, Lakesebu South Cotabato. She joyfully expressed her thankfulness in receiving the new pair of shoes for her daughter. Six-year-old Joshua Macadildig was born behind bars to a mother convicted of child mistreatment. Joshua was in foster care until the age of one when his grandmother Rosita was able to take him in and raise him. At 60 years old, Rosita struggles to keep food on the table much less meet any of Joshua’s other needs. Rosita relies on hand me downs and gifts from relatives to get by. Joshua attends grade 1 at Estaka Elementary School in Dipolog City. 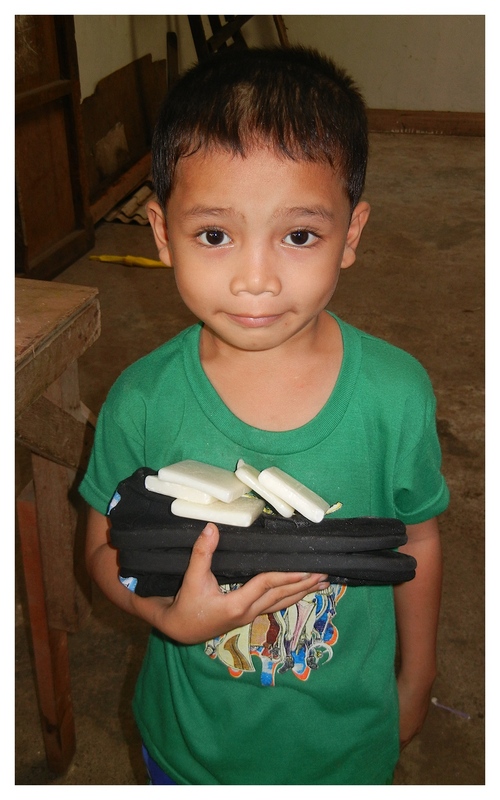 As a former ICM Jumpstart pupil attending Gumamela Learning Center in Bolicon Turno, Dipolog City, Joshua was eligible to receive a pair of TOMS shoes during the recent shoe drop. Charly Balila is from a large family. They only rely on his father’s small monthly income of P2,000 as a day laborer (US$46/month). This money is only allocated for food and other expenses like schooling (6 out of 8 children in the family were schooling); things like shoes were not given priority for the children. Charly’s mother, Doña was so grateful because four of her children received TOMS shoes. Charly is a Kindergarten recipient from Shining Stars Kindergarten and her siblings are ICM Elementary Scholar recipients. Six-year-old Jona Balasiw walks with his mother for more than an hour to get to school, crossing two rivers on the way. Sometime he doesn’t have any shoes to attend school so he doesn’t go. Because he walked barefoot to school with nothing to protect his feet, Jona has developed a skin disease that is noticeable on his lower legs and feet. This pair of TOMS shoes is so important to Jona. Stepping Free from Poverty to Stand on HOPE!